Tall fescue is an alternative to perennial ryegrass, particularly where summer growth is limited by high soil temperatures, or where perennial ryegrass persistence is an issue. It cannot be mixed with ryegrass. Tall fescue is easy to distinguish from ryegrass by its broader and stiffer leaves, which narrow to a point. Tall fescue pastures typically looks less dense and usually contain more clover. Tall fescue has greater summer growth than perennial ryegrass, with at least similar nutritive value. Grazing of tall fescue needs to be more strictly managed than perennial ryegrass to achieve its potential nutritive value. It is better adapted to hot and dry conditions than perennial ryegrass due to its deeper root system and higher temperature ceiling. This gives it a potential role in low rainfall regions. It can grow in less-fertile soils, is tolerant to a wider range of pH and waterlogging conditions, and can achieve higher persistency than perennial ryegrass. Tall fescue is likely to be most successfully integrated into a dairy system where a significant proportion of the farm (25% or more) is established in fescue rather than one or two paddocks. Paddocks that are summer dry, have suffered insect damage, or where ryegrass has failed to persist, are ideal candidates for renovation with tall fescue. Some cultivars are available with an endophyte (MaxP) which can enhance persistence of tall fescue where insect pests such as Argentine stem weevil or black beetle are present. MaxP produces the alkaloids peramine and loline and is safe for cattle. 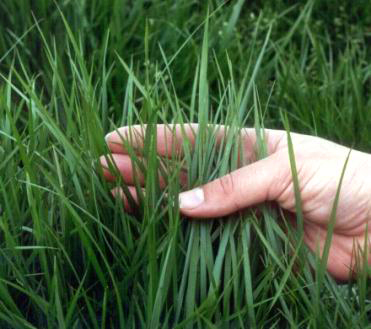 Tall fescue is slow to establish compared to ryegrass, and is sensitive to soil temperature. Sow in early autumn (February/early March) when soil temperatures are over 12°C. Lower soil temperatures (5-100C) will result in slower germination (28 days) and slower winter growth allowing weeds to smother the tall fescue. Tall fescue is sensitive to sowing depth. The ideal depth is 10mm and when sown more than 20mm few seedlings will emerge. Sow tall fescue as the main grass in a pasture seed mix at 25-30 kg/ha with clover(s). It should never be sown in mixture with ryegrass as ryegrass will dominate and the fescue will disappear. First grazing should be when plants are 15-20cm in height and checked for pulling. For the first 2-3 grazings if should not be grazed lower than 7cm, preferably with light stock (calves). It is recommended that the same post-grazing residual target be applied to tall fescue pastures as ryegrass pastures (e.g. 1500-1600 kgDM/ha or 7-8 clicks on the rising plate meter set on the formula “clicks” x 140 + 500). The feed quality of tall fescue declines when pasture mass exceeds 3000 kgDM/ha in the spring and summer period, and it can reach this more quickly than ryegrass, and once feed quality is lost it is difficult to graze well. It is not recommended that dairy farmers carry autumn-grown tall fescue through to the spring as it has a low palatability. It is better to graze early winter to provide fresh growth for the spring. There is no risk of ryegrass staggers from tall fescue either endophyte free or with the MaxP endophyte. Facial eczema risk is typically lower than ryegrass, but invasion by ryegrass will increase the risk. Due to tall fescue typically having high levels of clover, bloat management needs attention, especially in the first spring after autumn establishment when clover can be dominant. There are no additional metabolic issues, other than those experienced with ryegrass pastures, when grazing tall fescue with dairy cows. While DM yields of fescue are higher than ryegrass, its lower feed value means there is little advantage in potential milksolids production on many New Zealand dairy farms, or in wet summers.